IT’S 32 years since NEIL TENNANT and CHRIS LOWE formed the PET SHOP BOYS – and they are still getting better and better. New album Electric sees them embrace their love of dance music, and get their best-ever reviews. After a euphoric show in Munich the pair tell SFTW about their endurance and the latest chapter in their story. BACKSTAGE at Munich’s Tollwood festival, the Pet Shop Boys are knocking back champagne. “Champagne? On a Wednesday night!” mocks Neil Tennant as he takes a sip. “And it’s vintage” (vintaaage in the singer’s North Shields twang). But there are plenty of reasons for tonight’s revelry. Firstly it has been a mind-blowing show. The Pet Shop Boys are at the top of their game visually and musically. Dancers with minotaur heads and jackets made of drinking straws are met by thousands of fans for the party of the year. It is also Neil’s 59th birthday — but the biggest cause for celebration is that the duo have just released their 12th studio album, Electric, to their best reviews in years. Neil and Chris have been making synth-pop for more than 30 years, since meeting in an electronics shop on King’s Road, London in 1981. Neil says: “We do what we want to do for our own personal satisfaction. The only time the Pet Shop Boys experienced trouble in their career came in 1999 following their album Nightlife when their promoter went bust. “The album did well but we’d been booked on an arena tour of Britain,” says Neil. “Chris and I said, ‘We think this tour is too big’. “We were playing Sheffield Arena and there were 3,000 in a venue for 18,000. It was a financial disaster. “I remember having a minor meltdown and I said to Chris that we should knock it on the head. On stage the pair are phenomenal. Off stage they are also a double act. While Neil is the witty, charming leader, Chris has a deadpan sense of humour unexpected of the persona who hides away behind costume and sunglasses when he’s in the spotlight. Electric, Pet Shop Boys’ first release on their own x2/Kobalt label, arrives just ten months after their Top 10 album Elysium, their final release with Parlophone, who they had been on for 28 years. “Yes, we’d actually been at EMI for longer than anyone else apart from a woman in business affairs,” adds Neil. Seeing the duo perform tonight, an outlandishly stylish spectacle featuring hit after hit mixed with new tracks, explains why the duo have endured. So turning 59 tonight. How does that make you feel? I ask Neil. “I really don’t feel my age,” he replies. “I have friends of all different ages and I’ve always been into popular culture so that keeps me young. “Even before the Pet Shop Boys I worked for Marvel Comics and then Smash Hits so I like to know what the kids are thinking. Even if I don’t like it, I know what’s going on. “As for retiring, I never think about it. You retire if you’re working in a factory in Rochdale and you can’t wait to leave and concentrate on your racing pigeons. But my life has never been like that. Electric, a euphoric collaboration with producer Stuart Price, sees the pair return to their first love, dance music. Price, who is married to Pet Shop Boys’ manager Angela Becker, has worked with The Killers, Brandon Flowers and Madonna. Neil adds: “You have to thank Chris for where we have gone with Electric. This album started out as a joint thing but it was Chris who took it to another level. “I was thinking this record was going to be a disco one or even dance remixes, a different version of Elysium with new tracks but Chris wasn’t having it. He drew up the list of all the songs we had then wrote some new songs. The working relationship between Price and the band was one of trust and order. “We’d arrive in the morning and finish by 6pm,” says Neil. “And Stuart would have the TV on in the studio with the sound on. ALL DAY,” he stresses. “It drove me MAD but Stuart said it gave a rhythm to the day. The group experimented with different styles but both Neil and Chris agree it has always been about the songs rather than the producer. Neil adds: “When it comes to producers, it’s always the songs and who they suit. For Fundamental (their 2006 album) we got Trevor Horn in as we knew we were going to make a big production album so who better than Trevor? “Then on 2009’s Yes, the songs were really pop so we went to Brian Higgins and Xenomania. And it was amazing. The appeal of Pet Shop Boys, a duo who have sold 50 million records worldwide, is that there are no egos and no squabbles. While Neil credits Chris’s “desire to make music 24 hours”, it is Neil’ s restlessness that drives the work. Says Neil: “I feel sorry for Chris having to put up with me. I’m this restless person. “We saw this programme about The Beatles where John and George were moaning about Paul being on the phone, wanting to go into the studio. Chris was laughing saying it was like me.” Both Neil and Chris say making Electric was such an exciting time that they are planning two follow-up albums soon. “The idea is to make a trilogy,” says Chris. “With Stuart involved though I’m not sure we’ve told him yet,” he cackles. There are so many high points on Electric that it’s hard to single out tracks. Love Is A Bourgeois Construct “is pure Pet Shop Boys with that title,” says Neil. And their cover of Bruce Springsteen’s The Last To Die was suggested by Chris’s sister. Neil adds: “When we did that song with Stuart, it sounded like The Killers. It is like an equation — Pet Shop Boys performing Bruce Springsteen, produced by Stuart Price equals The Killers. Opening track Axis is classy — and inspired by Madonna. Another standout is Thursday, a duet with rapper Example. Neil adds: “I was worried that Example would groan at the prospect of working with us too but he agreed — but only if he sang too. And two weeks later he came back with the whole part written. We got to meet when he played at the O2 with us in June in London. 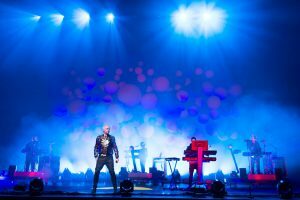 Pet Shop Boys’ show ends tonight with an encore of old and new. Live favourite Go West is followed by their 1985 No 1 West End Girls and then new single Vocal, a song the audience doesn’t know — not that you can tell by their wild reaction. Neil says: “The whole audience went crazy. I thought, ‘Wow!’ Then the laser kicks in. “And thank god those lasers worked,” says Chris. “They cost a bloody bomb. It’s what most of the budget went on. Neil adds: “We follow our instincts. Nothing is ever planned and responses to our music often puzzle us. But that’s what keeps us together and will keep us going for a long time yet. “It’s all about the music, it’s in our songs. The feeling of the warmth around us all is so strong.